Talkwebby is currently in private alpha. You can submit your email and it will inform you of when you can get your Talkwebby widget. So now that I got that out of the way, what is it? Talkwebby is simple in-video commenting that you can embed into the video on your website or blog. A simple interface that would allow users to easily comment on videos and create a discussion. I like showing videos and I like discussing videos. In class, students often struggle to discuss verbally. An option like this would allow students to comment on the video prior to class and then the teacher can mediate a discussion over the video in class. Here is a screenshot of the comment box in a YouTube video. If you have been an avid reader of this blog you know that I am not a fan of reinventing the wheel. I could certainly write about tools that I find on other blogs and give my own perspective and just "link" to their post, but that does not give them due diligence for the work that they did. From this thought I plan to start sharing Web 2.0 Resources that I find interesting from other Ed Tech type blogs and linking to their post so that you can pay them their dues for their initial work. I still plan on sharing what I find. If I could get my administrator to use one tool and/or one website it would be ____________________. The reason is because ________________________. "Outside of having a laptop or computer, the ONE piece of Educational Technology that I would want if given to me with no strings attached would be a ___________________ and I would use it with my students _____________________"
Please comment below. Would love to know everyone's thoughts. 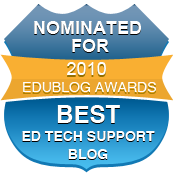 An Ed Tech Tip for Administrators - READ SOME BLOGS!! Discovering and reading blogs has been one, if not the most, influential personal and professional growth experiences in the past two years. I know that blogs have been around for a lot longer than two years, so I often think about what I was missing out on related to education prior to two years ago. The great thing about blogs is that there are several out there for anything. You can easily do a blog search to find one. Writing a blog has been a professional experience as well, but I will save that for a future Ed Tech Tip for Administrators. 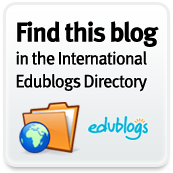 Today I wanted to share several examples of great blogs written by several administrators from across the globe. I recommend adding them to your Reader Account. 1.) Burlington High School Principals Blog: Written by Patrick Larkin - Shares his experiences and happenings at his school. Has done a great series of posts on Becoming a 1:1 school. This blog is a great example of how a principal can blog about the great thing his school is doing. 2.) A Principal's Reflections: Written by Eric Sheninger - Does a wonderful job reflecting on what it is like being a principal at a school that epitomizes 21st Century Learning. Occasionally has his students guest blog about what it is like being a student at his school. 3.) School Finance 101: Written by Bruce D. Baker - Money is the number one thing that can get an administrator in trouble. This blog does a wonderful job of discussing financing in education. You can learn more about why a blog about school finance here. 4.) The Principal of Change: Written by George Couros - The blog focuses on helping and insipring administrators and educators discover or rediscover their passion. He has a great list of Leadership Blogs in a list on the right hand side. 5.) Principal's Point of View: Written by Larry Fliegelman - Writes about "Education Reform, Leadership Essentials, Parent Involvement, Standards Based Grading and more." 6.) The Principal's Posts: Written by Lyn Hilt - Writes about her experiences as an elementary school principal and shares the happenings from her school. Occasionally has students write blog posts as well. Shares opinions and thoughts on education and educational technology as well. 7.) The Principals Page: Written by Michael Smith - Even administrators need humor and need to laugh about life as a principal. This blog does a good job of that while also providing thought provoking commentary on what it is like to be a Principal. 8.) Connected Principals: Written by Many Principals - "This blog is the collected thoughts of school administrators that want to share best practices in education. All of the authors have different experiences in education but all have the same goal; ensuring we do what is best for students." You can find a list of contributors by clicking on the pages at the top of the page. There are several other great administrator blogs that I have probably left off; my apologies. If you know of a great Administrator Blog or you are an administrator who writes a blog, feel free to comment with a link. Thanks!! Now subscribe and read some blogs!!! We recently did a computer refresh in our district and several teachers received computers with Windows 7. I recently typed up a document sharing with them 3 essential tools/apps that they could use in their classroom. I also wanted to share them here because it is be a bad assumption on my part to think that teachers know about them. So here is a short description of each tool, how to access the tool, and how to use the tool. Share with the teachers in your building who also use Windows 7. These are very simple and effective tools. b. Your screen will cloud over. Click and drag your mouse around the area that you want to capture. You will see a red line. c. Release your mouse button to capture your screen shot. e. Here is where you will save your image. There are some additional features: Draw, highlight, copy, etc. Use as you wish. a. Double clicking the icon will open up a post it note. You can type on it directly. b. Clicking the “+” will create a new post it note. d. The x will permanently delete your post it notes. a. Click to open and move your mouse around the screen to see the zoomed in areas. b. You will notice a magnifying glass. Click that to access options. d. Clicking on the settings icon (a gear) will allow you to activate color inversion and other features. iaza is a simplistic online photo editor that allows you to upload a photo from your computer or copy and paste a URL. Once you have done that, you have access to several editing features. The features allow you to make changes to the photo and see them instantly. You can then share the photos via Twitter or Facebook, or you can just right click and save your photo. There are so many features with iaza that I can't name them, so I took a screen shot and you can see it below....click on it to see full size. "Virtual field trips challenge and expose students to new types of technology. It is a great way to spark their interest and motivate their learning in a specific content area. Virtual field trips can offer students more opportunities because you can take them to places they wouldn't normally be able to go to otherwise - like inside a volcano or ocean floor! In addition, virtual field trips may even boost students' reading comprehension skills and will expose them to different cultures and environments." Check out the list and see what it might have to offer for your classroom. The Department of Education provides Federal Resources for Educational Excellence. Available within this resource are Animations, Primary Documents, Photos, and Videos. The resources are broken down by subject and then broken down by curriculum and/or time period. This would be a valuable first stop for teachers looking for some resources to use with their students. There are several valuable resources for every teacher. Bitlr is a social networking site that allows you to easily update status by including files with those status updates. I am a fan of using Facebook in the classroom and creating a page for classrooms that students and parents. We need to go where they are. Although Bitlr is not Facebook, the concept is a great one if you find yourself constantly updating a web page and including documents for your students to access. The user interface is very similar to Facebook. Each status is limited to 500 symbols/characters. You can easily upload files and images to your status. You can also embed a video from a URL. A great way to share a video and then use the comment section for discussion. You can invite students to join by sending them an email. You can do this by typing them in, or importing them. If it is a feature of Facebook, it is generally a feature on Bitlr. The combination of networking and file sharing was something I always thought was missing from Facebook. Makes me wonder how long (if this gets popular) before Facebook buys the rights to this. You can see a screenshot of the website below. I do wonder about some safety features of this site, so that would require further investigation if look at using it. Plus, it is probably blocked, so that might be something else worth looking into. If your district is still wondering about social networking with students, show them Edmodo as another option. Something I am hoping to do every week is provide an Ed Tech Tip for School Administrators. It is important that we get administrators to buy into using technology. If they are using it and get more comfortable with it, then it will trickle down to the teachers. If you missed the last tip on Google Alerts, I would check it out. This week I wanted to share a favorite site of mine called Wallwisher. With Wallwisher you can easily share a digital bulletin board with a simple question that teachers, parents, community members can provide feedback on in 160 characters or less. Users have the ability to remain anonymous or include their name. Creating a Wall is very easy and so is creating an account. With each wall you can choose the background, image, and create your own URL. For more information about Wallwisher, see my previous post. You can see a sample image of a Wallwisher wall below. So how could you use Wallwisher? 9.) Thinking of adding a new sport/elective? Ask students what they think. What other ways would you use Wallwisher with your faculty, staff, parents, students, and community? I wrote a post a while back with ways to use the FLIP Camera Across the Curriculum. Well, today it appears that Cisco is shutting down the FLIP Video Camera production. Kind of disappointing news considering how inexpensive the camera is, how easily it is to use, and how simple it is to use the software as well. Technology Departments loved the FLIPs because of the cost, and teachers loved them because they were easy to use. Now the attention will have to turn to alternatives. Personally, the best alternative is going to be mobile devices. Cameras on cell phones and tablets are getting better and better. There is a BYOT (Bring Your Own Technology) movement going on in many districts across the country due to budget concerns and lack of funds. If the students have them, why ban them and why pay for them (cost and maintenance) when students can bring their own...since they do anyway. But since so many districts are not embracing this method, there has to be alternatives to the FLIP camera. Well, there are; in fact, there are several. Kodak Zi8 (Approximately $160 new, less on Amazon) "The Kodak Zi8 Pocket Video Camera captures every experience in stunning 1080p HD video. Stay in focus while you’re on the move with integrated image stabilization. Then kick back and watch all the action on your HDTV or share your scene on YouTube with the built-in USB. The Zi8 pocket video camera has all you need to define yourself in high definition." Kodak PlaySport which can take some hard use because it is meant for rugged use (Approximately $100) This little camera can plunge up to 10 ft under water and capture the entire experience in full 1080p HD. And you don’t need to worry about blurry footage when things get a little shaky. With built-in image stabilization, the KODAK PLAYSPORT will stay steady as a rock. Samsung E10 (Approximately $75 new, less on Amazon) Includes a 270 degree swivel lens so you can record yourself and then swivel it to film other scenes. Also includes a touch screen and HD capability. Sony Bloggie Duo (Approximately $160) Star in your own HD videos and photos with the dual-screen MHS- FS2 Bloggie Duo camera. Front and back LCD screens makes self recording easy. Coby Cam4000 (Approximately $50) Swivel digital camcorder 2.4" TFT LCD screen flips and rotates 270°, with 4x digital zoom, LED photo flash for low-light situations, Video resolution; VGA (640 x 480), 32MB built-in memory (expandable to 8GB with optional SD/SDHC card). FLIP started a trend in "Shoot and Share" cameras, so there are several others, but this is a good starting point with several different price ranges and features. I encourage you to do some investigating of reviews and see what other people are saying. File sharing sites are abundant across the Internet these days. Sometimes though, you might not want to download the file but just view it. Dropdo is for that purpose and is very simple to use. First thing you do is upload a file, Word, Excel, PDF, PowerPoint, OpenOffice, RTF, CSV, etc. ), images (including EPS, SVG, PSD, Illustrator, etc. ), a few video formats, a few audio formats (including MP3), plain text, and markdown. Once you upload the file you will send a provided link to your friends where they will be able to view the file without downloading it. You can see samples of each by clicking on the links on the front page of Dropdo. After viewing, users will have the option to download the file as well. There is also a Chrome and Firefox extension as well. This could be a useful website for teachers who don't have access to other collaborative applications like Google Docs or Live @EDU. There are instances where a student might create a video and then has trouble getting it to a teacher. This is one way to fix that issue. Sometimes finding a really good lesson plan incorporating technology can be a tough test for many teachers. Luckily, there are teachers all throughout the United States who have created outstanding lessons using Google Apps. You can use various drop down menus to search through the lesson plans submitted by teachers. You can also submit your own lesson plan that you have created using Google Apps. To search the first thing you will do is choose the product. You can choose All, Apps+, Docs, Sites, or Calendar. Then choose the subject matter and grade level that you teach. There are approximately 30 available at the moment, but if your school uses Google Apps, then I highly recommend encouraging them to submit their lesson plans for other teachers. To learn more about Google Apps for Education, check out the Education Community and Resource Center to learn more about what they have to offer. Well, Spring Break is over, so back to the ole' daily grind. Not sure how much blogging will happen this week. Will spend the majority of my evenings studying for the Kentucky Principal's Test that I am taking this Saturday. Wish me luck! But enough about me, time for some resources. 1.) Here is an interesting concept. It is called Newspaper Blackout. Students take a newspaper and black out all the words to create a story, poem, quote, or whatever. What a neat activity for English teachers. The link will take you to a "blog," but in reality, this would be a neat classroom notebook to create. I could see this same format being used in other subjects when wanting to find the most important parts of an article/story. 2.) Cummings Study Guides provides various study guides for Shakespeare, Edgar Allen Poe, and various other types of literature. There is a vast index worth checking out. 3.) Capitonyms are words that sometimes should be capitalized, while other times they should not be. This resource will help students in K-12 become for familiar with those words. 4.) The Basics of APA Style is a web-based slide presentation that also includes voice over. It does a good job of explaining APA formatting. 5.) "The Favorite Poem Project is dedicated to celebrating, documenting and encouraging poetry’s role in Americans’ lives. Robert Pinsky, the 39th Poet Laureate of the United States, founded the Favorite Poem Project shortly after the Library of Congress appointed him to the post in 1997." 6.) Knowing Poe is an interactive website designed to share about Poe the Person, Poe the Write, and Poe's Library. 1.) From Free Technology for Teachers is 7 Good Sources for Math Videos. Looking to integrate video into your math class? This is a great start. 2.) Looking for some online calculators? Jeff Lay's Ed Tech Blog has 15 Websites for Free Online Calculators. 2.) Here is a collection of Earth Science Power Point Presentations that might be worth checking out. 3.) Planet Science is a website for free & fun Science resources for children, young people, teachers and parents. 4.) Solar System Scope is probably the most complete interactive solar system application on the web. A must see for any Earth-Space or Astronomy teacher. First, my apologies for not properly citing some previous resources shared by Ken Halla who writes several valuable Social Studies blogs. Lifelong learning is valuable, even if it is a quick lesson in web based resource sharing. 1.) Here are Ken Halla's blogs. I recommend adding them to your reader if you teach social studies, or share social studies resources with teachers. US History Teachers Blog, US Government Teachers Blog, World History Teachers Blog, Social Studies and History Teacher's Blog, and Teaching High School Psychology Blog. 3.) From the Teachers Domain comes a video, questions, and background essay about Nuclear Meltdowns from Frontline and a focus on Chernobyl. A valuable lesson with the recent events in Japan. 5.) HistoryBuff is a nonprofit organization devoted to providing free primary source materials for students, teachers, and anyone who loves history. The sites primary focus is on how news of major and not so major events in American history were reported in newspapers of the time. You can also find panoramas of historic sites in America. 6.) Click 2 Map is a website that allows users to create maps with their own points of interest and then embed them onto a website. It is very similar to Tripline. A welcoming April Spring day in Kentucky. Lots of rain in March, so it is good to see the sun today. UK plays today, so guess where everyone in this state will be tonight? I will probably watch the game too, but I cheer for their rival, so I won't be watching it for the same reasons....he he. 1.) Synonym Finder is a website designed to helps writers from using the same words over and over. You will also find antonyms and definitions as well, and examples of use in a sentence. 2.) Wordis is a website where visitors can share their thoughts on any word. "Share your insight, your story, your vision…We give you words; everything else is after you." 3.) Memidex is a free online dictionary and thesaurus with a simple interface, complete inflections, auto-suggest, adult-filtering, frequent updates, a browsable index, support for mobile devices, and millions of external reference links for definitions, audio, and etymology. It's fast too. 4.) Idioms 4 You is a website dedicated to providing several examples of English idioms. Not only can you read them, but you can also hear them. The author of the website has recorded the samples of idioms for visitors. 1.) Dan Meyer is a math teacher and math blogger. He recently did a TED talk "Math Class Needs a Makeover." If you are a math teacher, I highly recommend watching his talk. 2.) Uses for Math is a website that provides lessons and activities for how math can be used in the real world. Everyday jobs, sports, medicine, and even solving crime. 3.) The Math Worksheet Site allows users to create an endless supply of printable math worksheets. The intuitive interface gives you the ability to easily customize each worksheet to target your student's specific needs. Every worksheet is created when you request it, so they are different every time. 1.) Wonderville is a fun, interactive destination for kids to discover the exciting world of science. This award-winning site encourages exploration and curiosity, while helping kids discover how much fun science can be. 2.) The Science Spot is a website for middle school science teachers that provides links to various web resources. You will also find lessons and activities as well. 3.) Late Nite Labs offers students and teachers hundreds of preset and customizable science labs that can be conducted completely online. Teachers can get access for free, but their is a cost for students. So it is a great tool to use in the classroom by the instructor. It should probably be the other way around. 2.) The Trans-Atlantic Slave Trade Database has information on around 35,000 slave voyages. You can search the voyages database, examine estimates of the slave trade, and search through a African names database. In the coming years I plan to be finished with my Administration certification and pursue an assistant principal position. When I get to that position, I don't want to forget several of the awesome tools and services that are available to teachers that can be adapted to being an administrator. The first order of business for a new administrator is to setup some Google Alerts. With Google Alerts you can add in the search terms you are looking for, determine the source of alert you want (Everything, blogs, news, etc), determine how often you want to receive alerts (as it happens, daily, or weekly), and the volume of results (All results or just the best results). You then provide the email attached to your Google Account. You can see the image below of the menu options. 6.) Get alerts for Central Office staff as well. How would you use Google Alerts?